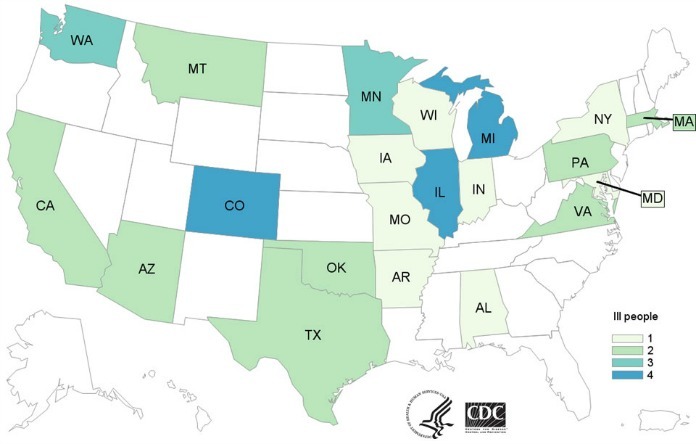 The E. coli outbreak linked to General Mills flour has expanded to include 42 people in 21 states, an increase of four cases and one state, Indiana, since the last update from the Centers for Disease Control and Prevention (CDC), the agency reported today. Also today, the Minneapolis-based company expanded the recall of Gold Medal Flour, Signature Kitchens Flour, and Gold Medal Wondra Flour to include additional lots. The recall expansion was triggered after a newly-reported illness was associated with raw dough or batter linked to flour produced last fall. Health officials have isolated the outbreak strain of shiga toxin-producing Escherichia coli (STEC O121) was isolated from samples of General Mills flour collected from the homes of people who were sickened in Arizona, Colorado, and Oklahoma. Eleven of those sickened required hospitalization. None of them has developed hemolytic uremic syndrome (HUS), a life-threatening complication of some E. coli infections that leads to kidney failure. Young children, seniors and those with compromised immunes systems are at greatest risk of developing E. coli infections and for associated complications such as (HUS). E. coli symptoms usually develop within two to five days of exposure but can appear within 24 hours or take as long as 10 days to develop. They include stomach cramps and diarrhea, that is sometimes bloody. These symptoms, which last about a week, are sometimes accompanied by a low-grade fever. Anyone who ate the recalled flour and developed theses symptoms should see a doctor. Onset of illness for case patients in this outbreak, who range in age from 1 year to 95, were reported from December 21, 2015 to June 8, 2016. Some of the case patients reported eating or playing with dough before they became ill. The U.S. Food and Drug Administration (FDA) and the CDC warn consumers to only eat product containing flour if they have been cooked properly through baking, frying, sautéing or boiling and to thoroughly clean hands, surfaces, and utensils after contact with flour or dough. The case-by-case count is as follows: Alabama (1), Arkansas (1), Arizona (2), California (2), Colorado (4), Iowa (1), Illinois (4), Indiana (1), Massachusetts (2), Maryland (1), Michigan (4), Minnesota (3), Missouri (1), Montana (2), New York (1), Oklahoma (2), Pennsylvania (2), Texas (2), Virginia (2), Washington (3) and Wisconsin (1).